There were few spectacular announcements of radical new aircraft at this year’s EAA AirVenture Oshkosh show, held July 27 through August 3, but the popular event was well attended, the crowds enjoyed the first-ever appearance of a U.S. military jet aerobatic team–the Air Force Thunderbirds–and there were plenty of exciting attractions. Whereas last year there was a palpable feeling that the government had let the industry down by sending the Experimental Aircraft Association (EAA) a half-million-dollar bill for ATC services and not showing up because of sequestration budget cuts, this year employees from the FAA and other agencies were out in droves. Of course, the FAA still charged the EAA for ATC services during a week that saw more than 10,000 aircraft arriving in the Oshkosh area and some days where parking space for arrivals was completely full. But the government agencies clearly made an effort to share in the Oshkosh camaraderie, and visitors welcomed their presence, including the Customs and Border Protection personnel who made a big effort to calm fears about random stops of general aviation pilots. While all of the various types of flying during the show went off flawlessly, there was an accident on July 31, when a Breezy homebuilt crashed while landing, killing the pilot and injuring the passenger. FAA and NTSB personnel at the show started investigating the accident immediately. 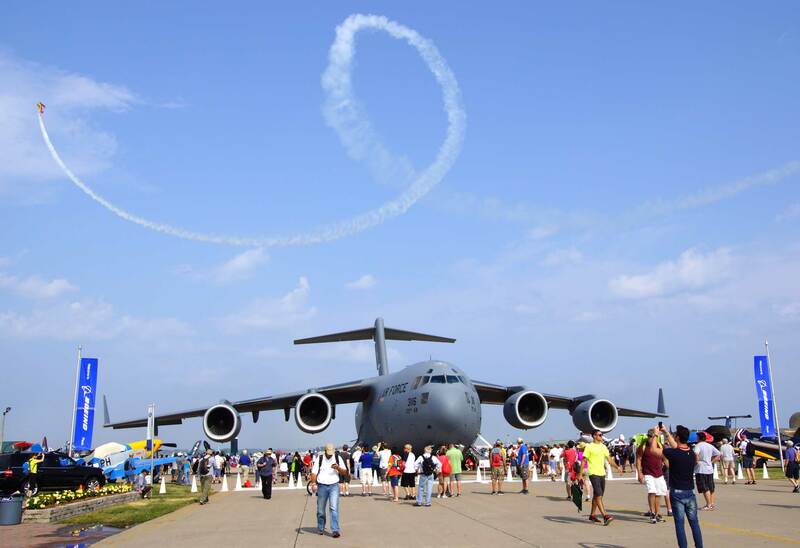 This year’s weather began benign, with low humidity and moderate temperatures, but later in the week sporadic thunderstorms, including some hail, bedeviled show-goers but only partially delayed some of the airshow acts. At the annual EAA fundraising Gathering of Eagles event on July 31, the Young Eagles auction of unusual prizes raised $1.8 million, including a $200,000 bid for the Ford Mustang F-35 Lightning II Edition donated by longtime EAA supporter Ford Motor Company. This year one unusual auction item was a “mystery box,” which turned out to be a full Sonex airplane kit donated by GE. Another lucky bidder paid thousands of dollars to hit a target on a dunk tank modeled after an airliner, on which sat a resigned but willing Jeff Skiles–one of the miracle-on-the-Hudson A320 pilots–who soon emerged with his uniform completely wet. All for a good cause, of course. At the event, Young Eagles pioneer Greg Anderson, who came up with the original idea to fly one million kids, was honored with the Phillips 66 Aviation Leadership Award. Anderson, who now heads the Wings Over the Rockies Air & Space Museum in Denver, saw his goal reached in just 10 years, and now more than 1.8 million Young Eagles have enjoyed their first airplane ride. Anderson also worked closely with Phillips 66 to set up the company’s fuel rebate program for Young Eagles pilots. Every day of AirVenture 2014 was also a celebration of EAA founder Paul Poberezny, who died shortly after last year’s show. “It’s a significant year to recognize what Paul has done,” said Pelton. “Every day we’re doing something special for Paul. It’s not a memorial; it’s a celebration.” The celebration included a missing-man formation flown on the evening before the show’s opening and a historical display in the EAA Welcome Center highlighting Poberezny’s accomplishments, including the 51-percent rule that paved the way for the homebuilding movement. The week also started with the kick-off of construction of the One-Week Wonder, a Zenith CH-750 Cruzer built by volunteers in seven days. It taxied under its own power (a new 912iS donated by Rotax) by the end of the airshow on August 3 and made its first flight on August 5, with Skiles at the controls. A special event was held by AirVenture sponsor Hamilton Watch to introduce the newest film by One Six Right producer Brian Terwilliger. The film, Aviation: The Invisible Highway, celebrates “how the airplane has changed the world” and is intended to appeal to a much wider audience than One Six Right, which was more focused on the pilot’s perspective. Terwilliger shared the trailer for the new movie and encouraged interested viewers to share the link to the trailer (www.aviationtheinvisiblehighway.com). Terwilliger has been working on the new movie for the past six years, capturing all-original footage in 18 countries on seven continents. The movie is narrated by pilot and actor Harrison Ford. Many pilots, including Pelton, were hoping that the FAA would announce progress on the EAA/AOPA petition for exemption for recreational pilots to fly light aircraft without a third-class medical certificate, but such news was not forthcoming. At the Meet the Administrator session on July 31, FAA Administrator Michael Huerta announced that he had signed off on the FAA’s notice of proposed rulemaking for changes to the third-class medical but he couldn’t reveal any details for fear of compromising the process. While the rulemaking process is under way, he added, “we haven’t ruled out the exemption as an interim step. But we don’t want to have an unintended effect of that, which would be to prevent us from expeditiously completing the rulemaking process. My leadership team at the FAA has worked hard to draft a notice of proposed rulemaking. I signed it out last week. It’s now going through an administration review where our goal is to issue the notice this fall and to receive your comments on it.” – M.T. The first production HondaJet–N420EX, which has a “deep-green-pearl” paint scheme–made its public debut at AirVenture, just one month after the aircraft first flew from the company’s headquarters in Greensboro, N.C. Following a celebratory event at AirVenture’s Boeing Square, the HondaJet concluded the day with a flight demonstration during the afternoon airshow that included high- and low-speed passes. First deliveries of the $4.5 million jet are expected to start early next year. Nextant Aerospace’s G90XT King Air C90A remanufacturing program is steps closer to certification later this year, with installation of new 750-shp GE H75 engines under way and unveiling of the turboprop’s new instrument panel at AirVenture. The new panel is not a typical King Air Garmin G1000 upgrade but a complete redesign of the flight deck with workload-saving single-lever power controls. Two Garmin PFDs flank a large center MFD, with a Mid-Continent Instruments standby attitude module for backup and a Luma Technologies LED glareshield warning panel. A carbon-fiber layer adds a modern accent to the panel, as does removing the fuel panel from the left sidewall. Fuel system controls are mounted above the power levers, replacing pressurization switches that are no longer needed because the pressurization system is digitally integrated. Fuel, oxygen, pneumatic and vacuum gages are all hosted on the MFD, too. Embraer Executive Jets senior vice president Jose Eduardo Costas said the company recently began deliveries of its revised entry-level and large jets, the Phenom 100 and Lineage 1000. Those aircraft are being rebadged with the “E” suffix, which stands for “enhanced,” he said. The 100E gets new wing spoilers that will reduce descent speeds and enhance the aircraft’s lift-dump aerodynamic braking ability on the ground. There are also new choices available for cabin seating and cabinets, as well as interior colors and fabrics. The spoilers will be made available as a retrofit kit for existing 100s for approximately $300,000, Costas said. Textron Aviation’s Cessna subsidiary announced the new diesel-powered Turbo Skyhawk JT-A, powered by the turbocharged, 155-hp Continental Motors Centurion CD-155, which is already STC’d for the Cessna 172. Retail price for the G1000-equipped Skyhawk JT-A will be $435,000, $65,000 more than the similarly equipped 180-hp Lycoming avgas-powered Skyhawk. Certification and deliveries are expected next year. Cirrus co-founder and chairman Dale Klapmeier said the company plans to spool up production of its SF50 Vision single-engine jet to 125 per year after the aircraft is certified next year. Klapmeier said the company is exploring various options to expand its production capacity to meet demand, including the foreign manufacture of components. Cirrus, which currently counts deposits for 550 copies of its jet, flew its first SF50 production prototype on March 24, and the prototype did a flyby on July 27 during Cirrus’s evening pre-AirVenture party. That aircraft will be joined by two other test aircraft later this year. The price remains at less than $2 million. Icon showed off the first production version of its A5 light sport aircraft (LSA). Engineering Serial Number 1 (ESN-1) is the first of the company’s aircraft to be built from the production design, using production tooling, methods and components. ESN-1, which took five months to construct, made its first flight in July and will be one of three aircraft used to verify performance ahead of next year’s anticipated LSA certification. The second production prototype is slated for completion later this fall, while the third aircraft in the test program will also be the first to be delivered to a customer. A new competitor on the amphibious LSA front is MVP (most versatile plane), a company that plans to offer a folding-wing LSA with a unique floating platform hull. The instrument panel hinges out of the way and four panels can fold down over the forward deck, covering the cockpit seats and allowing for two people to lay down flat. MVP is planning to offer the airplane as a kit, then an experimental LSA and finally as a production LSA. Flight Design USA president Tom Peghiny said that the company’s newest airplane, the four-seat C4, should fly early this month. The $250,000 C4 will be powered by Continental’s alternate fuel IO-360-AF, which is scheduled for certification by year-end. The 180-hp (derated) engine is designed to run on avgas and avgas alternatives. The avionics selected for the C4 include Garmin’s G3X Touch displays, which will be included in the airplane certification as they are not TSO’d, and Garmin’s GTN750 com/navigator, also a touchscreen unit. The C4 features a unique safety box energy-absorbing cockpit design that protects the occupants in case of a crash. Experimental aircraft manufacturer Sonex Aircraft introduced its AeroVee Turbo engine and had more details on its in-development SubSonex personal jet. The Turbo boosts the power of the standard AeroVee engine to 100 hp from 80 hp. AeroVee engines are sold as kits, and the Turbo is priced at $10,995. Deliveries are scheduled to begin in the fourth quarter. An upgrade package to turbocharge normally aspirated AeroVees costs $3,995. Sonex president John Monnett announced pricing for the company’s SubSonex one-person jet and said kit deliveries will begin in the fourth quarter. The SubSonex JSX2 is powered by the PBS T1-100 turbojet and has a range of about 500 nm, consuming 18 gph on average. Price for a SubSonex kit is $130,000, with a $5,000 option for additional assistance for jets registered in the experimental exhibition category, which negates the 51-percent rule requiring builders to construct more than half of an experimental aircraft themselves. A BRS parachute system is standard, and an optional MGL iEFIS Explorer avionics package is available for $5,440. Strausberg, Germany-based Stemme showcased its S10VT high-performance motor glider at AirVenture 2014, on the heels of forging a manufacturing and marketing agreement with LSA OEM Remos Aircraft of Pasewalk, Germany. The S10VT, powered by a 115-hp turbocharged Rotax 914F, features a patented folding propeller that enables the engine to be deployed or stowed in a matter of seconds, without changing the aircraft’s aerodynamics or center of gravity. The aircraft is designed to self-launch, to soar as a high-performance glider (50:1 glide ratio) and serve as an efficient touring aircraft. Though certified by the FAA and first offered for sale in the U.S. more than 20 years ago, in recent years the brand has languished. Following a management change, Stemme returned to AirVenture last year for the first time “in many years,” said Mark Stevenson, who in January was named president of Stemme USA, which is based in West Columbia, S.C. Currently, the majority of parts for the composite aircraft are made by subcontractors in Poland, but manufacturing will be transferred to the Remos factory in Pasewalk, and Stemme is now the worldwide distributor of Remos aircraft under the agreement signed in June. The S10VT base price is approximately $400,000, and $446,000 equipped with LX900 gliding computer, solar panels and other typical options. Quest Aircraft brought a Kodiak single-engine turboprop equipped with the newly certified Summit interior to AirVenture, along with another Kodiak fitted with the base Tundra interior. The Summit features a club-four layout in the cabin, with one or an optional two seats in the rear of the cabin. Upcoming improvements to the Kodiak include an enhancement many customers had been requesting–integration of Garmin’s GFC700 autopilot with its G1000 flight deck. The GFC700 replaces the S-Tec 55, and the upgrade will be retrofittable to older Kodiaks. New Kodiaks will be equipped with the GFC700 shortly after certification, so the production-line switchover should take place around the beginning of the fourth quarter. Quest does not expect the new autopilot will drive the Kodiak’s price up. Backed with cash from Asian investors, the relaunched Mooney International has spent the last eight months hiring staff at both its Kerrville, Texas production plant and its new Chino, Calif. headquarters and R&D center. The company now employs 150 and recently completed its first aircraft–an M20TN Acclaim Type S–since the new investors took control. Mooney’s new CEO is Dr. Jerry Chen, an aerodynamicist who was on the faculty of the University of Southern California. Chen told AIN that the reborn company has sufficient reserves to operate at a loss for at least five years and will be focusing on the production of the $699,000 Acclaim flagship. The company also plans to restart production of the Ovation3, which has a list price of $649,000. Chen said the R&D efforts in Chino will focus on the development of aircraft modifications and new aircraft. Separately, Mooney announced that it is partnering with Redbird Flight Simulators to equip Mooney facilities at Kerrville, Chino and Beijing with Redbird FMX full-motion simulators. The simulators will have Mooney-branded graphics, enclosed cockpits and quick-change configurations. They will be used for sales, transition training and pilot proficiency instruction. Another Chinese development is the investment by a Beijing company called Zair in True Flight Aerospace, current owner of the Tiger Aircraft type certificates. According to a Zair spokesman, the Tiger will soon return to production with a new Garmin G1000 avionics suite. As promised last year, the PBS TP100 turbine-powered RV-10 flew to this year’s AirVenture. Turbine Solution Group of Deland, Fla., converted the RV-10 to turbine power and is planning to offer a firewall-forward TP100 kit for RV-10 builders. The TP100 delivers 241 shp and specific fuel consumption of .82 pounds per horsepower per hour, with a dry weight of 121 pounds. Flying-car builder Terrafugia had a noticeably smaller presence at AirVenture this year than in previous years, with a display at the Innovation Center and no models of the Transition roadable aircraft on hand. Last year, Terrafugia flew the Transition during the airshow. According to Terrafugia, the Transition has been flight-testing with two people on board and “is currently progressing through the final design phase leading to construction of a third-generation conforming prototype.” First delivery of the Transition is now scheduled for the second quarter of 2016. Also on display at the Innovation Center was the Elytron vertical takeoff and landing concept aircraft. The two-seat demonstrator showed the Elytron design, with two wings, one in front and one in back, enclosing a center tilting wing on which engines are mounted. If engines fail, the two fixed wings enable gliding to a safe landing, according to the company. Solar-powered aircraft could offer a low-cost way to train future pilots, if the partners developing the Sun Flyer succeed in their ambitious plans. A technology demonstrator–a PC-Aero Elektra One–for the Sun Flyer solar-powered airplane made its first flight in July in Munich, Germany, and was on display at AirVenture 2014 at the Redbird Flight Simulations pavilion. The Sun Flyer is under development by Aero Electric Aircraft, Bye Aerospace and PC-Aero. Simulator manufacturer Redbird will be the training system provider. The company developed an electric-powered Cessna Skyhawk that flew about a dozen times in 2012 during tests at Centennial Airport in Englewood, Colo. The Sun Flyer will be a two-seat, all-composite, electrically powered light sport airplane using solar cells mounted on the wings to supplement lithium-ion batteries. The batteries are made by Panasonic, and the battery management system and motor controller is made by Germany’s Geiger Engineering. Operating costs will be two to five times lower than those of a typical two-seat, gasoline-powered trainer, according to Aero Electric. South African engine development company Adept Airmotive displayed its 320-hp, 120-degree V6 at the Innovation Center, having introduced the technology to AirVenture visitors at last year’s show. The 320T engine is liquid-cooled, features Fadec control and can run on almost any type of fuel such as avgas, auto gas or biofuel. First customer for the engine is Vliegmasjien, which is installing the engine in its C-Wolf single-engine amphibian. Superior Air Parts and Christiansen Aviation have agreed to develop a supplemental type certificate (STC) to install Superior’s 180-hp Vantage engine on later-model Cessna 172Rs and -Ss. The Vantage is an FAA-certified, 361-cu-in, 180-hp, four-cylinder, air-cooled piston engine designed to run on 100LL avgas or 91-octane unleaded auto gas (without ethanol). A new Vantage engine with the Skyhawk STC is expected to cost $25,000, including a two-year warranty (or to TBO, whichever comes first). According to Superior, this is roughly the cost to overhaul the Lycoming that powers the 172R and -S models. American Champion Aircraft (ACA) announced that it will offer a diesel-powered version of the Denali Scout two-seat utility model, likely by 2016. The aircraft is currently powered by a 210-hp Lycoming IO-390. The company plans to offer the 2.0-liter, 180-hp Austro E4 (marketed as the AE300)–an engine certified to power several models of Diamond Aircraft–in the Scout as a way of substantially increasing its range to 1,200 nm from 700 nm and to make the aircraft more attractive to markets where 100LL fuel is either absent, scarce or prohibitively expensive. While a firm price for the diesel engine option has not been set, ACA expects it to add approximately $40,000 to the price of the Denali Scout, which currently retails for $275,000 typically equipped. Continental Motors unveiled the new three-liter V6 CD-300-series diesel engine at AirVenture. The first CD-300 is a turbocharged 310-hp engine, based on automotive technology, and turns at 2300 rpm. The engine’s critical altitude is 8,000 feet and service ceiling 25,000 feet. Continental is targeting a time between removal (TBR) of more than 2,400 hours, and the engine is designed to fit four- to six-seat airplanes. Certification is expected in 2016. Safran’s SMA general aviation engine unit plans to deliver 90 of its SR305-230E four-cylinder general aviation diesel engines this year for Cessna’s 182 JT-A and other aircraft such as the OAP Delfin. The engine, which has a TBO of 2,400 hours, has already received EASA and FAA certification. SMA is also developing a higher-output version of the engine, likely in the 260- to 285-hp range. The power gain in the higher-output model would come from a combination of adding fuel injection and increasing engine speed. Work continues on SMA’s SR460 six-cylinder twin-turbo diesel engine, designed for 330- to 400-hp applications, including installation on piston twins. SMA also revealed the cause of a catastrophic failure of an SR305 in a 182 JT-A aircraft last August where the aircraft was forced to make an emergency landing and the test pilot was unharmed. The failure was caused by a faulty engine bearing, the result of a lapse in quality control. “The problem was identified and corrected and is now behind us,” said CEO Thierry Hurtes. Certification for the JT-A aircraft itself is expected shortly. DeltaHawk brought a Cirrus SR20 powered by its diesel engine to AirVenture, and expects FAA certification of the engine in the middle of next year. Production of non-certified engines is slated to begin in the fourth quarter of this year. While Signature Flight Support doesn’t own the FBO at Oshkosh’s Wittman Regional, AirVenture visitors were able to enjoy the company’s hospitality at a lounge carved out of the government building on the show grounds. The lounge had the best seats at the show and was filled with grateful visitors during the many rainstorms that drenched the grounds. And while drying off, they could view the storms live on iPads running the ForeFlight Mobile app. At AirVenture, Signature announced that it is supporting Able Flight with an $8,000 scholarship for pilot training. Able Flight helps physically disabled people learn to fly in specially equipped light sport airplanes. There were multiple opportunities for pilots and future pilots to test their skills on simulators at this year’s AirVenture. These included Redbird simulators at the Society of Aviation and Flight Educators Pilot Proficiency Center; the IMC Club’s IFR Proficiency Center with Redbird simulators and live ATC services provided by PilotEdge; and the Mindstar Aviation Airspace VR setup, where pilots fly various scenarios in virtual airspace overseen by an air traffic controller who is “working” the room full of pilots. Redbird alone brought 29 simulators to AirVenture, including it’s new full-motion VTO helicopter sim. Simulator manufacturer Elite Simulation Solutions announced the opening of two of its new training and safety management centers, in Orlando, Fla., and Dubendorf, Switzerland. The centers are designed to “provide a stress-free environment for pilots to learn, rehearse, review, practice, socialize and turn training into an enjoyable experience,” according to the company. In addition to FAA- and EASA-approved training devices, the centers offer classrooms, conference rooms, a library and testing facility for pilots, instructors, students and aviation enthusiasts as well as facilities that can be used by local flight schools. Classes will include ground school, pre-hire testing, scenario-based training, initial, recurrent, IFR, VFR, pilot/ATC communications and avionics training. SocialFlight also introduced the Parade of Planes, which for 2014 takes place this month. This feature alerts SocialFlight users when manufacturers’ airplanes are in their local areas for demonstration flights and visits. Potential buyers normally travel to airshows and other events to see such aircraft, but SocialFlight’s Parade of Planes makes it convenient to see the aircraft when they are nearby. Engine modification firm Blackhawk announced a deal with maintenance program provider Jet Support Services (JSSI) at AirVenture that will give customers the option of upgrading to new Blackhawk conversions in place of standard overhauls. Under the deal, JSSI will contribute to the value of the overhaul while customers would make up the difference in price. Helicopter training simulator provider X-Copter demonstrated its recently certified primary flight simulator, which replicates the Robinson R22 and R44 equipped with Garmin G500H avionics. Currently in development are training simulator platforms for the Robinson R66, as well as Schweizer, Bell and Eurocopter models. Twelve challengers flew in the final round of the Flying Challenger Cup on July 30 in front of a crowd at AirVenture’s Boeing Square, pitting their Redbird simulator flying skills against each other in three final events–a short-field takeoff, steep turn and precision landing to a full stop on a virtual Runway 18 at Wittman Regional. The winners were: Patrick Webb, for the pilot category; Kevin Sandoval, student pilot category; and Matthew Smith, non-pilot category. All received a Garmin G2 pilot’s watch, a Lightspeed headset and a flight with the Aeroshell aerobatic team during the show. The 12 finalists received free transportation to Oshkosh, as well as complimentary hotel rooms. One of the most unusual aircraft at this year’s AirVenture was The Lark of Duluth, a fully flyable replica of the first airplane to carry a paying passenger. Over a span of five-and-a-half years the Minnesota-based Duluth Aviation Institute constructed the Benoist Type XIV flying boat as a tribute to the memory of the Duluth residents who owned the original Lark, which on Jan. 1, 1914, carried a lone passenger from St. Petersburg, Fla., across the bay to Tampa. The replica airplane, which was built with volunteer labor contributions from Institute trustees and local EAA members, recreated that historic flight exactly a century later.